It looks like crude put in a 10 year cycle low in December so I wouldn’t expect it to break that low any time soon. Crude should trade back over $ 100 in the next few years before this cycle up move is completed. I can’t argue with your successful forecasting so far but will see if cycles or waves prevail. Thanks for the 10yr cycle and your comment. We use a 88+/- month (7.3yr) cycle which picks up the lows in late’78, mid’86, early ’94, late ’01, late ’08 and early ’16 – our long-term outlook is for $183+/- but if last year’s decline from October is 5-waves into December, then it must break this low before trending higher again. Very best wishes. This time the Wavetrack guy is right. Why is the 10 year cycle important? 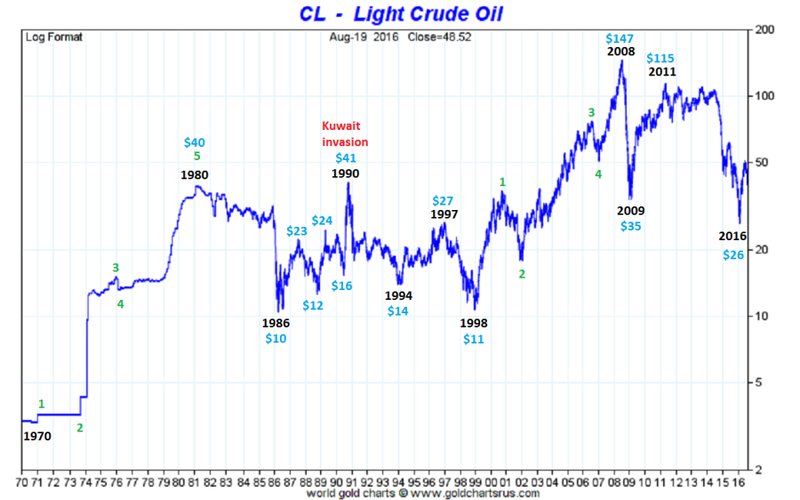 My opinion – crude oil do not have a cycle repeating with regularity so for example Hurst cycles do not work good, but look at Benner cycles repeating sequence 11-10-7 years consisting of 2 or 3 x three and a half years cycle. That is why you see 10 years cycle(10 and 11 years above) and Wavetrack 7.3 years (2×3.5) the sub-cycle.